Osprey Marine Hatch Latch: Secure Hatch Locks for Yachts & Boats. Safeguard your Boat or Yacht and its equipment against robbery with 'Hatch Latch' - the best boat hatch lock on the market - read reviews from £125. Hatch Latch is a secure and elegant hatch lock designed for virtually all types of yachts and boats. Ensure security from burglary and safety with Hatch Latch - It's a well know fact that as the dark months approach, boat theft increases, avoid being a statistic with our quality products. These boat locks are built to provide security for many years. It has been a busy year for Hatch Latch sales; one of the comments we keep hearing is that there is not another product on the market that combines security in harbour, safety at sea and conforms to the ISAF regulations. 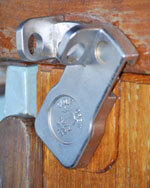 Latches that can be opened or closed above or below decks, fully securing companion-way from flooding in extreme weather. A must for blue water sailors. 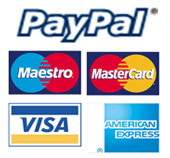 Versions available to suit most yachts and hatches. Quick and easy to fit by yachtsmen and boatyards alike. Typical installation time 20 minutes. Every Hatch Latch includes detailed fitting instructions, screws, self-adhesive template and drills for the DIY boat-owner. Extremely robust and fully engineered for the marine environment. Labyrinth seal prevents ingress of rain or sea water through the wash board. Available with recommended high-security closed-shackle Kasp Padlocks. Thanks to our major suppliers at Sparta for all their hard work in keeping up with orders. "Clearly the Hatch-Latch boat lock is a serious piece of kit whose cost, in light of the expensive gear aboard many yachts, should be regarded as a safe investment."